BUYING! X Checkout $19.50Buy Now! 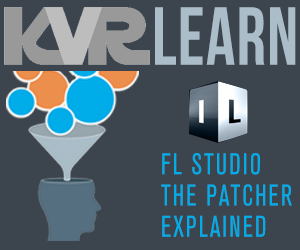 Mastering Limiter by Studio Toolz is a Virtual Effect Audio Plugin. It functions as a VST Plugin. Minimal System Plugins run on Windows based PC's using a suitable VST host or DAW. Our plugins have been fully tested within Ableton Live, Adobe Audition, Cakewalk Sonar, FL Studio, Energy XT, Presonus Studio One, Renoise, and Cubase. 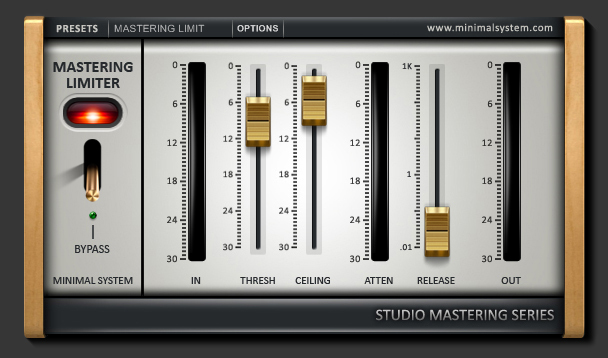 The Mastering Limiter from Minimal System is a high end audio processing advanced peak limiter designed to maximize both the level of the digital signal and the resolution of your final rendered file. The Mastering Limiter's lookahead peak limiter algorithm provides the mixing and mastering engineer with the capability to increase resolution and production master levels with precise control. Specifically designed for mastering, digital editing, multimedia, and any application that requires limiting of the digital signal with highest quality; the Mastering Limiter is perfect addition to your mixing and mastering tool set. In order to ensure the maximum possible resolution of a processed signal, it is very highly recommended that the Mastering Limiter be used last in the processing chain. This plugin is 32-bit but can be run on 64-bit systems using jBridge. This plugin also operates within the 64-bit versions of Cubase, Nuendo, Bitwig Studio, Reaper, Tracktion, Renoise, FL Studio, Sonar, Mixcraft and Samplitude using their inbuilt bridging.